-aim, shift = zoom ( 1,3x ) + some weapon handling effects, may be less mouse sensivity. I would be interested to try this out. I think it's important that mouse-sensitivity is not lowered for this case, because it should allow quickly looking around. The next step would be to link this mode to free-look. I do not believe any degree of zoom is authentic or immersive. Wait for 1.15 to see how aiming and long-range combat will be changed. the " realistic " zoom depends very much on size of your monitor. Its just useless to talk about " what FOV is more realistic " or " what zoom is realistic, is zoom realistic at all " if you dont even say what size of monitor you are talking about. My monitor is 54cm wide. Ro2 has 85-91 degrees FOV, but lets say it's 90 degrees. If I will bring my eyes on 27 CM from monitor ( when i aim in game on very far distances, i bring my eyes on even closer distance sometimes. I dont want to say that everybody must do the same thing, just giving an example. ) i will get exactly the same size of all objects in the game as in reality. Why? simply because screen will take 90 degrees of my view. Game is 90 degrees FOV; screen takes 90 degrees of my view... => all objects in game are exactly the same size as they should be in reality. Or may be i am wrong, if so, tell me where did i do a mistake, please. You will say that there are also pixels that doesnt let you see enemies very good. Yes, but its another problem. There are generally 3 problems, they are completely separate from each other and you must not bring them together. 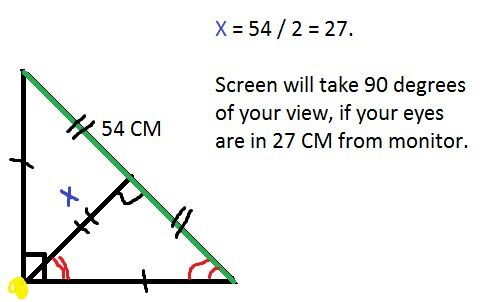 Basically, the last problem is solved if you have big enough monitor and you put your eyes close to monitor, that distance between monitor and your eyes will be half of monitor width. In my case its 27 CM, monitor width is 54 CM. For players with smaller monitors its probably a problem, but 2x zoom is definitely not a solution. Pixels are a big problem. Your target can be just as big as in reality, if you put your eyes close enough to monitor - it can be even bigger, but its detailization can be very bad. In IOM without zoom if you try to shoot enemies on 200+ meters, they will be literally 1-3 pixels wide. I would say that small zoom can partially solve this problem, because far targets will become more detailized. But definitely, 2x zoom is just waaaaaay too much.